Found that I needed to fudge the oblong border for the Roosting Robin, what I envisioned didn't work out so version 2. 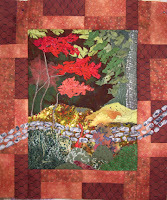 Still need to add the extra leaves and do some creative machine quilting. Maybe this arvo. I love how your central design spills over into the border. Are you going to post this picture on the roosting robin blog also? I have tagged your blog. If you are interested in joining in check out the details in my blog.